Is There Gender Equity in Hermetic Qabalah? Many people on various Pagan paths are drawn to study Qabalah, a form of Western mysticism. At first glance it may seem like a good fit. 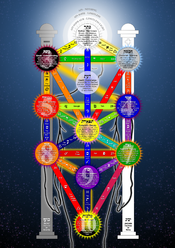 Qabalah includes both female and male divine images as part of the sefirot (Hebrew, plural; singular, sefirah), also called emanations, which occur on the Tree of Life, long a Goddess symbol. But a closer look at Qabalah reveals problems for those who seek gender equity in spiritual life, reject hierarchies, and see spirit immanent in the material world. Hermetic Qabalah, the basis of the Western mystical or "mystery" tradition, took its most widely known form in the Hermetic Order of the Golden Dawn, which flourished in the late 19th and early 20th centuries in Great Britain and to a lesser extent continental Europe and the United States and gave the world several influential teachers including Arthur E. Waite, Aleister Crowley, and Dion Fortune. The beliefs of the Golden Dawn were a pastiche of Jewish Kabbalah, Egyptian and Greek traditions and deities, and Christianity. Their practices were interwoven with the use and symbolism of Tarot, a deck of 78 illustrated cards. Parts of the Order's rituals appear similar to today's Wiccan practices. WriteWork contributors. "Is There Gender Equity in Hermetic Qabalah?" WriteWork.com. WriteWork.com, 03 January, 2005. Web. 22 Apr. 2019.